Need more information about booking Home 7471334 ? We rent our beautiful bungalow on Molchowsee as a whole ensemble, so cottage with covered porch, parking space, private garden right on the lake and private dock. The distance from the house to the water is about 40 m and runs down to the sea through the garden. A boat with an outboard motor, which may be driven without a license (4 people) is ready to drive on the web and can be rented. 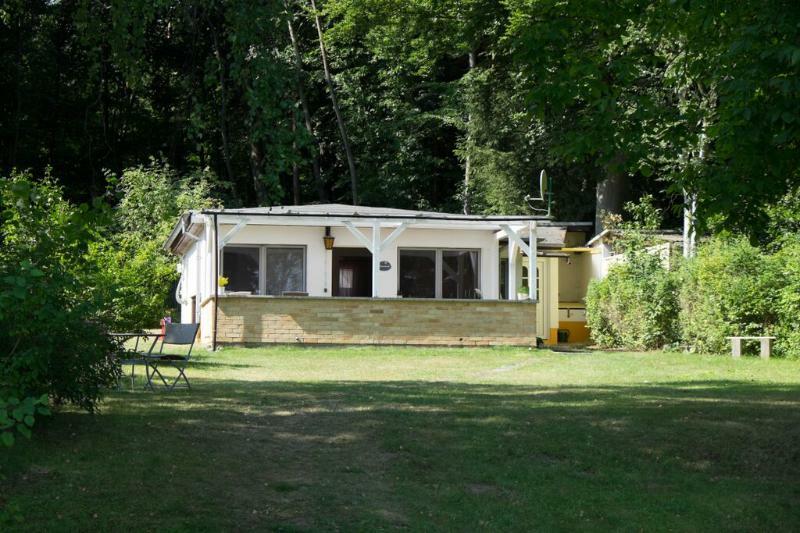 In the bungalow there are 2 bedrooms with a double bed, a bathroom with shower and a fully equipped kitchen. In the living room is a sitting area with TV and Internet. In the dining area with a large table and seating for up to 8 people is also the rare rainy day with games or reading can endure well. Before the house there is a covered terrace overlooking the lake, which has an additional dining area. The bungalow is located near Neuruppin, a beautiful shopping city. There all shops for daily needs are provided. By car or bicycle Neuruppin is easily and quickly accessible. And who once missed the big city life, in an hour by car or train directly in Berlin with all its wonderful sights, its flair and its dynamics. Usually we rent for 1 week, from Saturday to Saturday. At least 4 nights. The rent for the entire ensemble is graded as follows; April and October / November € 80 / night May and Sept 90 € / night in June, July and August 100 € / Night boat with an outboard motor 20 € / day or - preliminary price 120 € / week (excl. Petrol costs) We look forward to visitors from around the world and are happy to assist you with any further questions! Please note that guests must bring their own bedding, towels and kitchen towels. In case of early departure you will charge the full booking amount charged for the accommodation. This accommodation is reached via a dirt road and might not be available for some vehicles. You can get in touch with Ute (the owner) through the contact form on this page. Send Ute (the owner) an email through the contact form on this page. Alternatively, if there’s a phone number on this page, you can call them. How do I contact Ute (the owner)? If you’ve already booked, go to Manage your holiday booking to view Ute the owner's contact details or send them a message. Or send Ute (the owner) an enquiry through the Contact the owner/manager form if you’d like a quote or more info first. When you pay online through the Book your stay form, a booking request is sent to Ute (the owner). You’ll find out within 24 hours whether they’ve accepted - no money will leave your account before then. You can also request a quote from Ute (the owner) through the contact form. The owner will email you the total cost for your dates and a link to book and pay online. Use the Book your stay form to pay provisionally online. You can pay by credit/debit card or PayPal. Ute (the owner) will have 24 hours to accept the booking and no money will leave your account before then. Why can't I call Ute (the owner) before booking? You’ll need to contact Ute (the owner) to do this. Send them a message in Manage your holiday booking or through the contact form on this page. You can request to change the dates or number of people on your booking via the Manage your holiday booking page. To change your holiday dates use the Edit booking button. If you need to change the number of guests staying then send Ute (the owner) a message. If Ute (the owner) agrees, they’ll send you a revised quote outlining the changes. You can review and accept/decline this from the Manage your holiday booking page. You’ll have 48 hours to take action before the revised quote expires.